The Professional Piezo Dynamic 50-Watt Megaphone With USB from Pyle packs a powerful large diameter bell and piezo driver for a projection range up to 0.6 miles. 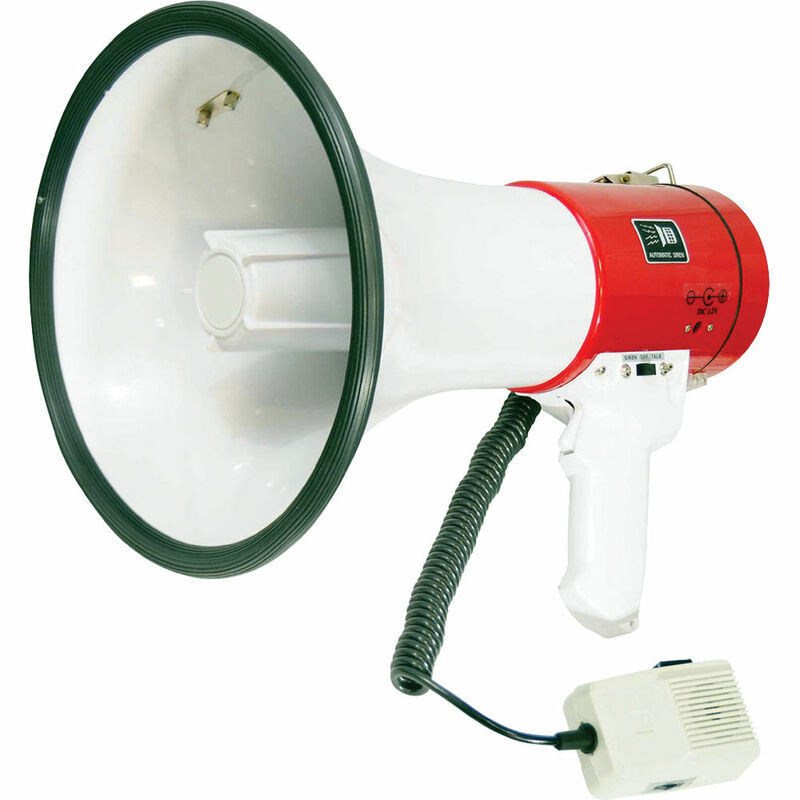 The megaphone runs on 8 C batteries (not included) or on a 9 V DC power supply (requires separate purchase). The megaphone features 2 modes - talk and siren, as well as a USB input so you can connect an mp3 player or other music/recording device to the megaphone. Box Dimensions (LxWxH) 14.0 x 9.6 x 9.4"
Professional Piezo Dynamic 50-Watt Megaphone With USB is rated 4.0 out of 5 by 4. Rated 4 out of 5 by Ivo Vicentim from This megaphone will scream for you! It's a great product, but I believe that it would be best if there was an optional rechargeble battery for this model. The USB port is great, even though it will distort the sound in a very high volume. The volume level is awkward when using the USB mode, because it is on the button that skips to next and when using the microphone, the volume is changed on a dial directly at the microphone. Besides this, it's a great megaphone. Rated 3 out of 5 by Recruit Terror from Useful, but cheap I run a fire recruit program and ordered this megaphone to broadcast information over a distance for my recruits. Within a week of having this tool, the microphone clip on the back fell off. After looking into the issue, it appears the screws used to hold the clip are not long enough to get a good bite in the plastic. I have doctored it up with some super glue to see if it will hold. For the price, I expected a little more. Where can you send your unit for repair? Can you still talk while your playing music from the megaphone? In regards to the Pyle pro PMP58U, you can play the music on the USB drive and speak at the same time. They will not affect each other.